Just give us a call, or email (below). We’re open everyday. 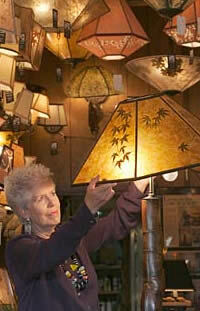 All of Sue Johnson’s handcrafted lamps are created at the Berkeley shop. The artisans who design and make our custom lamp shades also work as the sales staff. So please, ask us about our creations and discover a new world of unique lamps and lamp shades. We are open every day to help you make appropriate lamp and lamp shade choices to meet your home lighting needs. We look forward to meeting you. Do you have lamps that need new lamp shades? Bring them in and we can update them with beautiful ones chosen from the wide variety available at the shop or we can specially design custom lamp shades for them. Do you have decorative objects that could be transformed into unique lamps? Our sales staff and wiring department can help turn your treasured objects into one-of-a-kind custom lamps. Do you have lamps that need repair? Bring them in and our experienced wiring staff will inspect them and provide an estimate; generally repairs can be done within a week. Our unique lamps and lamp shades make distinctive gifts; for newlyweds, as housewarming gifts, for any special person and occasion. We offer gift certificates and gift registry services; we gladly accept gift exchanges for store credit.